Just two days following the horrific shooting and deaths that occurred in Nice, France, Alliance Française d'Atlanta and its supporting community decided to press on with their annual Bastille Day celebration scheduled to be held on the terrace of the magnificent Nelson Mullins Law building in Atlanta. 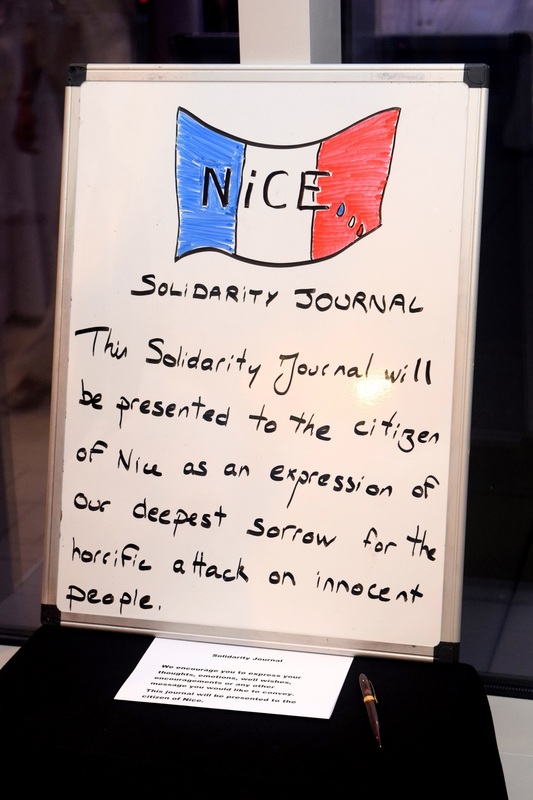 Just a day prior to the event, the patrons of AFA TL (Alliance Française d'Atlanta) received a formal memo from Director Hélène Touré expressing their heart-felt sympathy for the people affected by these events in Nice. She says, "While deeply saddened, we have decided not to give in to fear and allow those who use violence as their weapon of choice to win... We will press on tomorrow, not out of disrespect, but out of respect for liberty, equality, and brotherhood for all. It will also be a time for celebration of the power of people coming together during difficult times." And with undying support and an overwhelming response from the local community, we all showed up for the festive event that evening to celebrate life, French culture and its influence in Atlanta. For those of you that may not be familiar with this Bastille Day Celebration in Atlanta, let me tell ya', it's an event that you don't want to miss! All guests are decked in white formal wear and the ambiance is filled with local and traveling Francophiles, Francophone Natives, great music, authentic French food and finally, a runway show on the beautiful outdoor terrace of the Nelson Mullins building. This year, the fashion show was all swimwear featuring the classic French brand Vilebeqruin. This year in particular, the runway show absolutely captivated the crowd because there were not only adult models, but child models accompanying them. This is exactly what the Vilebeqruin promotes, a lifestyle brand stapled for its vibrant, and contrasting pacific patterns for man, woman, boy and girl. Prior to the show facilitated by the renowned Mistress of Ceremony, Theo Tyson of Trinity Productions, we feasted on delectable French foods including various cheeses, stews and other popular dishes related to the country. The Bastille Day Celebration also held a silent auction featuring packages such as brunch/ lunches to local cuisines, travel packages, designer products and more. For more, please visit www.afatl.com. Photos Courtesy of Lindsay Abarca Photography.